Drooling … just as I was settling in with the KX3 and MTR-3B. :-^ How much longer before QRP School does a review? Also, just saw a wordless video on using the MTR with an iPhone to do compact/QRP PSK31. Have you tried this, Cliff? Thank you for the great YouTube channel, as always. My KX2 is in Nashville today… only 20 miles away. So close, yet so far. UPS is delivering it tomorrow. I’ll probably do a quick review later this week. I am going out of town for a week on Saturday so I’ll try to get that in this week. Cliff, will you be reviewing this radio? I am hoping to see some good reviews for it. Maybe a side job to buy it. I understand it’s cheaper than the KX3. The KX2 is $750 for the basic radio. If you opt for the internal antenna tuner, the internal Lithium Ion battery/charger, and the attachable paddles, you’ll spend > $1,100. 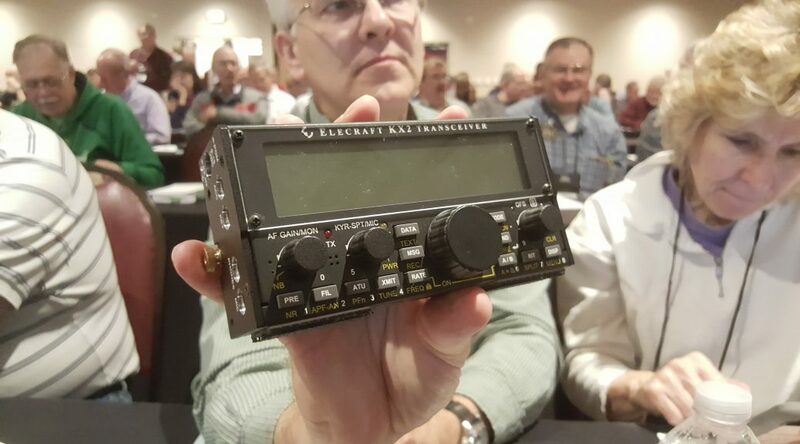 So, as usual with Elecraft, you can get your foot in the door for a reasonable price but the add-ons will quickly increase the price. Still, if you’ve got an external tuner (or use resonant antennas and don’t need a tuner) and an external battery, you can spend only $750 and get on-the-air for a reasonable price. Speaking of add-ons for the KX2, I was told by someone at the Elecraft booth that you can’t purchase the Lithium Ion battery without also purchasing their charger. The story goes that Tenergy makes the battery pack and will not warranty the pack, or any incidental damage to the radio (by the battery) if you use a different charger. The battery does not seem to be anything more than a common 11.1v Li pack similar to the one at http://www.amazon.com/AT-Tenergy-2600mAh-Protected-Rechargeable/dp/B00U0P3CNM If you get a chance to review this week, I am curious about your thoughts on the battery/charger story. Does it appear to be a special fabrication made for KX2s only? The charger for the Lithium Ion battery pack for the KX2 looks like the same Lithium Ion charger that I got with my Stark Power 9Ah Lithium Ion battery. I suspect there’s no difference at all. Just a guess, but I think it’s a CYA thing required by their attorney. And I can’t say I blame them, really. I’d probably have to do the same thing just to protect the company. Even the threat of getting sued causes lawyers to get involved which costs money. I’ve had to deal with it in my company and I guess a lot of people have. Can’t wait to see your review. Looks like the KX2 would have been perfect for me. Never on 160 and would never opt for 2 meters. Since I already have the KX3 I will have to be satisfied with watching your review. Don, I’m loving the KX2. The internal battery lasts a long time and the KX2’s display can tell you how much current has been drawn from the battery. This, along with all of the other capabilities of the rig, makes it a true Home Run (again) from Elecraft. Because I love to work portable, and the KX2 does everything I want in a portable rig, I’m having sort of the opposite problem of yours… how do I justify keeping my KX3?